OTT VOD Platform Netflix now accounts for 4.82% of peak downstream traffic on European fixed-line networks, up from 3.44% in autumn last year, according to Sandvine. 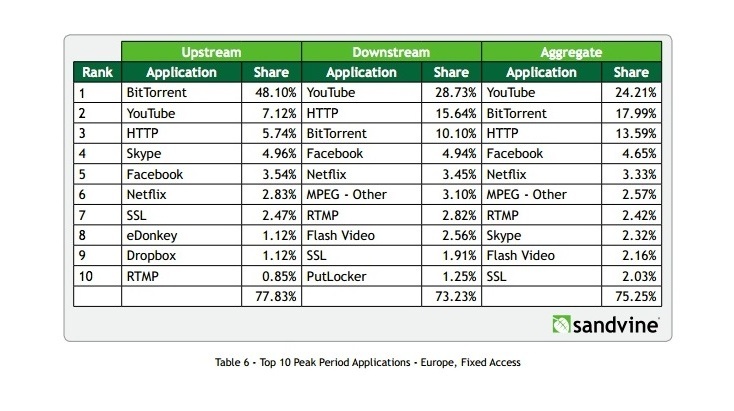 The broadband network solutions firm’s latest ‘Global Internet Phenomena’ report for Europe and Asia-Pacific said that Netflix accounts for more than 20% of network traffic in the UK and Ireland, while in countries where it has recently launched such as Austria and France it already accounts for approximately 10% of peak downstream traffic. “Netflix is planning additional European expansion once again this October, with subscribers in Italy, Portugal, and Spain expected to be able to access the service for the first time. This continued expansion makes it a realistic possibility that Netflix will be among the top three applications on European networks in 2016,” said Sandvine.